For all their absurdity, the Super Mario Bros. games follow a straightforward template. An Italian plumber adventures in a magical land, fights evil monsters and rescues a princess. It’s simple, but Nintendo’s vibrant fairy tale could have been fertile ground for a Hollywood fantasy epic. Instead, when Super Mario Bros. released in 1993, it portrayed a version of Mario that was worlds away from Nintendo’s vision. The Mushroom Kingdom had been turned into a neon-lit cyberpunk city where dinosaurs had evolved into humans. Bowser was a leather-suited politician fascinated by mud baths. The iconic goombas had become eight-foot tall lizard warriors with shrunken heads. Super Mario Bros. stands as one of Hollywood’s worst adaptations, but the story behind the film is infinitely more bizarre than the one the movie tells. By 1990, Super Mario Bros. was one of the biggest intellectual properties on the planet. Super Mario World had just released in Japan, and the face of Nintendo’s chubby plumber had been slapped on everything from T-shirts and comic books to cereal boxes. Mario’s name alone was worth millions. It didn’t take long for the motion picture industry to come knocking on Nintendo’s door. As always, Nintendo was cautious with its property. The publisher knew Super Mario Bros. didn’t have a deep narrative. How would a movie studio translate the simple formula into a 90-minute film? Producer Roland Joffé thought he could figure it out. Joffé’s Lightmotive production company was inexperienced, but Joffé had directed the Oscar-nominated films The Killing Fields and The Mission, which gave the studio some clout. Nintendo was intrigued by Joffé’s ideas, but it was more interested in the fact that Joffé had agreed to let Nintendo retain merchandising rights from the film. Joffé walked away with a $2 million contract. In a rare moment for the character, Mario’s future was now partially out of Nintendo’s control. After securing the rights to the film, Lightmotive immediately set to work trying to sign high-level talent. The studio approached Danny DeVito to both direct the film and play Mario. Both Arnold Schwarzenegger and Michael Keaton were approached for the role of King Koopa. All three passed on the project. According to Super Mario: How Nintendo Conquered America by Jeff Ryan, Tom Hanks briefly signed on to play Mario, but some executives thought that Hanks was asking for too much money, so they fired Hanks in favor of English thespian Bob Hoskins. Hoskins was hot off the success of films like Who Framed Roger Rabbit and Hook, and the producers felt that he would be a more bankable star. Within a matter of years, Tom Hanks would win Oscars for both Philadelphia and Forrest Gump, becoming one of Hollywood’s most respected actors. Hoskins is now best known for his television work. While Lightmotive continued its search for actors and directors, it commissioned the first of many scripts. Barry Morrow, one of the Academy Award-winning writers of Rain Man, took first crack at the plot, but his treatment was deemed too dramatic and the project was passed over to the writing team that had worked on The Flintstones and Richie Rich. This version of the script was more in line with Mario’s roots. Mario and Luigi traveled to a magical land reminiscent of The Wizard of Oz and Alice in Wonderland. In this world, the evil King Koopa – an actual green lizard king – had kidnapped a Princess named Hildy and made her his bride, so that he could access the magical Crown of Invincibility. The Mario brothers and their sidekick Toad set off on a quest to rescue the princess and prevent Koopa from getting his hands on the artifact. This script was likely the closest the film would ever get to emulating the playful world imagined in Nintendo’s games. However, Lightmotive had already signed a directorial team to the project, and these visionaries would take the film down some wild rabbit holes. Directors Rocky Morton and Annabel Jankel didn’t have many movie credits to their names. In fact, the husband and wife team had only directed one other film, a critical and commercial bomb called D.O.A.. The duo cut their teeth directing commercials for Coca-Cola and Hardee’s restaurants, eventually finding small success after creating the television series Max Headroom. Lightmotive loved Max Headroom’s zany vibe and felt that Morton and Jankel had the right imagination for a film like Super Mario Bros.
Morton and Jankel’s vision for the film was much darker than the Nintendo game series. They wanted their film to take place in an alternate reality version of New York, a place called Dinohatten. After an asteroid struck Earth 65 million years ago, all of the planet’s dinosaurs had been banished to a dystopian version of our world, but the two realities were still connected by a portal under New York. As the eons passed, the dinosaurs slowly evolved into humanoids and grew to hate the mammals that blissfully walked around Earth prime. As the production rushed toward principal photography, the directors and producers struggled to agree on a script to match the movie’s new direction. More rewrites were issued. One action-packed treatment seemed inspired by Die Hard. The script itself contained a scene in which Bruce Willis could make a cameo, scurrying through the air ducts above King Koopa’s office. Another script featured Mad Max-style death races. It seemed that the Super Mario Bros. film was pulling inspiration from everything except the game series that shared its name. By mid-1992, production was well under way. Holding to the director’s inspiration for a darker film, Lightmotive agreed to hire the art director who worked on Blade Runner to transform an abandoned cement plant in North Carolina into a cyberpunk wonderland. Campaign posters portrayed Dennis Hopper’s version of King Koopa kissing babies. Street vendors served kabobs of flame-broiled lizard. A club called the Boom Boom Bar advertised hot blood cocktails. Electric cars trailed sparks as they buzzed through the city’s main artery. Not everyone shared Morton and Jankel’s vision for the film. The studio was expecting a lighthearted kids film, and most of the cast and crew had signed on with similar expectations. The tensions between these two visions began to tear apart the production. The studio felt that the movie was too dark, pressuring Morton and Jankel to lighten the tone. Lightmotive brought in the writer from Bill & Ted’s Excellent Adventure to write yet another version of the script. By this point, at least nine writers had worked on the film, and rewrites would continue long after the cameras started rolling. The script ballooned into a rainbow of confusion as the production crew was continually handed new color-coded daily edits. Despite Morton and Jankel’s vision for a movie that sounded nothing like Nintendo’s series, the duo attentively worked in several video game references. Yoshi appeared as King Koopa’s pet, and spray-painted SNES Super Scopes functioned as portable devolution guns during the film’s climax. One key reference almost didn’t make the cut; Morton and Jankel didn’t want the Mario brothers to appear in their classic red and green overalls. 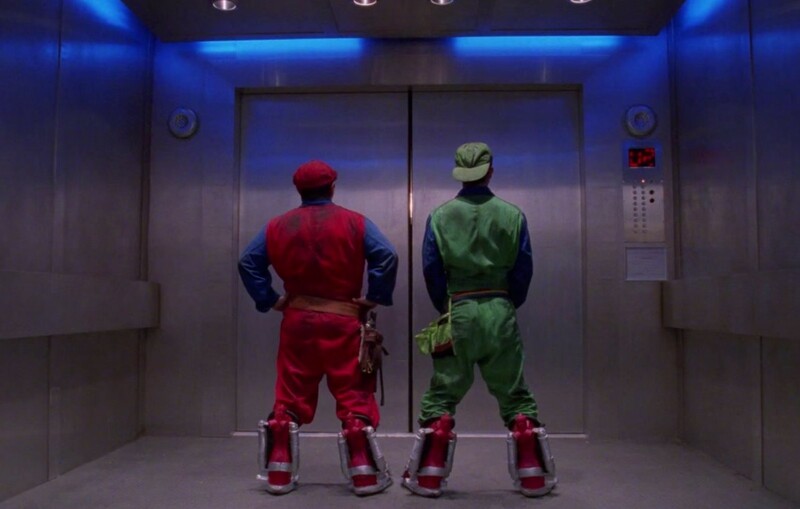 They fought with the producers about the costumes for weeks but finally consented, allowing Mario and Luigi to don their familiar outfits about three fourths of the way through the film. Filming was scheduled to last 10 weeks, but it slowly stretched into 15. Everyone had different ways of dealing with the frustrating production schedule. John Leguizamo, who had been cast as Luigi, started drinking. In his biography, Pimps, Hos, Playa Hatas, and All the Rest of My Hollywood Friends: My Life, Leguizamo describes how he started doing shots of scotch with Hoskins between scenes. During a scene in which Leguizamo was driving a van, the actor was reportedly drunk and braked too hard, causing the sliding door to smash shut on Hoskins’ hand. During certain sequences of the film, Hoskins can briefly be seen wearing a pink cast. Other members of the crew saw the chaotic production as an opportunity. According to SMB Movie Archive, Fisher Stevens and Richard Edson, who played Koopa’s henchmen Spike and Iggy, started writing their own dialogue, and even convinced the studio to film a rap scene starring them that was ultimately cut from the theatrical release. At one point in the original script, Koopa had their characters devolved into goombas, but the actors sold the directors on the idea that their characters should be further evolved to become super smart instead. Plot changes like this weren’t just common – they were happening on a daily basis. Over budget, behind schedule, and managing a cast and crew that was either drunk, working off-script, or completely belligerent, Super Mario Bros. had run completely off rails. But this train hadn’t wrecked yet. The end of Super Mario Bros. was a hack job. Morton and Jankel had hoped to film an epic battle sequence on the Brooklyn Bridge. Storyboards were drawn up in which the two realities would start to merge as Mario faced off against Bowser on the iconic structure. Mario eventually won after dropping a Bob-Omb down Koopa’s throat then kicking him into the river before he exploded. The scene would never be filmed. The film’s producers were tired of spending money on the production. Instead, Koopa was blasted with the Super Scope guns and reduced to a primordial sludge. After principle photography ended, the film’s producers tried to cut Morton and Jankel out of the picture. Lightmotive had gotten two other production companies to buy into the film, and now there were three sets of producers that had money at stake if the movie bombed. Many producers felt that the film needed more action, so a second unit set out to film a couple extra action sequences. Morton and Jankel weren’t invited to those shoots, but that wasn’t the only thing the directing duo was shut out from. Super Mario Bros. released to theaters on May 28, 1993. The film cost $48 million to make and grossed less than $21 million. Going up against hit summer films like Mrs. Doubtfire, The Fugitive, and Jurassic Park, the movie probably never had a chance to make back its money. Even Tom Hanks’ new film, Sleepless in Seattle, out-grossed Mario by $200 million. No one was happy. A lot of excuses can be made for Super Mario Bros. It was made during a different era. No one had tried to make a big-budget video game movie before. Video game companies didn’t know how much input they should have on the production. And special effects technology limited directors’ abilities to portray some of the more fantastical elements often found in a game. However, it’s hard to escape the fact that Super Mario Bros. was a bad film – a byproduct of a hundred bad choices and unfortunate mishaps. Super Mario Bros. should stand as a testament for the wrong way to make a video game movie. Maybe the industry will figure out how to do it right some day.